Meat Samosa | Simple and Delicious ! Ramadan kareem to all readers! 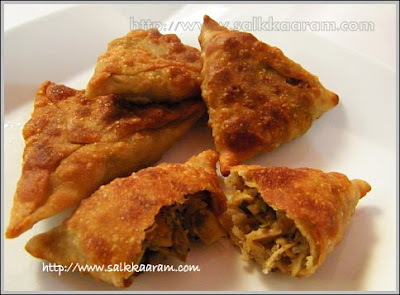 Anyway am posting a simple meat samosa recipe, that you can make with our usual ingredients..
Cook chicken, allow to cool. Remove meat from bone, keep aside. Use the leftover broth to make soup or any other thing. Chop onion, ginger,green chillies and curry leaves. Heat little oil, saute onion. When it is semi transparent, add ginger, green chillies and curry leaves and saute until aroma comes. Add shredded chicken into this with garam masala powder and pepper powder. Stir well, add salt if needed. Sprinkle coriander leaves, mix and remove from fire. Make samosas, using this filling. 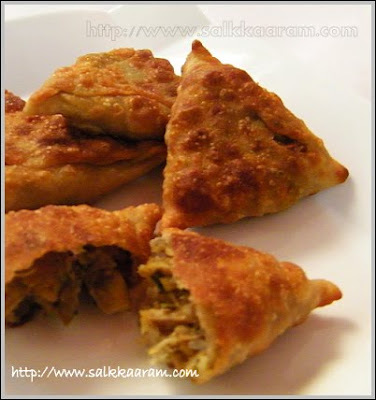 For samosa cover, check the vegetable samosa recipe, which I had posted earlier. Good effort.. thank you for sharing.. I'm subscribing to your blog via feeds. Pls dont disppoint me.. Happy Ramadan to you and your family, Seena! You've really made it sound very simple to make. I've never tried making samosas coz i always felt that its too complicated, especially getting the textures right. I liked your post and feel encouraged to give it a try. I think I will revert after a first attempt. Ramadan Kareem Seena..,to you and all in family..
Well said da,mikkavarum vicharikkunne spending lots of time preparing dish aanu ramdan ennanu..You are s true inspiration dear.. But i have seen people who is really really into prayers and good things in this holly month.. These samosas look very delicious Seena. can u help me with a recipe using "rooh afza"? Ramadan Kareem! !Now I can smell somebody started frying samosas..Enthokke paranjalum ethokke kanumbol engane undakkathirikkum..inne enta menu?Pinne rooh afza entha?? Rooh afza is also known as rose syrup.Muslims from pakistan and North India(I think)would normally use this to make rose milk or falooda at the time of breaking fast. check the below link to know more..
Hmm...the meat samosas look so good! We used tog et these in our college canteen and they used to be sold in minutes! hi,first time here! you have got a wonderful blog, as well as mouthwatering dishes. Would try out your recipes for sure. Good going!! I love these samosas. They look so good. I just love anything with spices. Gives such a good feeling.